From Manual Of the Planes to Dungeon Master's Guide Core Rulebook II, from	Dungeon Master's Guide to Dungeon Master's Guide II, we can help you find the role playing games books you are looking for. As the world's largest independent marketplace for new, used and rare books, you always get the best in service and value when you buy from Biblio.com, and all of your purchases are backed by our return guarantee. 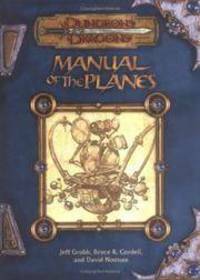 The Manual of the Planes (abbreviated MoP) is a manual for the Dungeons and Dragons role-playing game. This text addresses the planar cosmology of the game universe. The original book (for use with Advanced Dungeons and Dragons 1st Edition) was published in 1987 by TSR, Inc.. For 2nd Edition, concern over inclusion of angels and demons led TSR to forgo the release, though they compensated years later with the Planescape campaign setting. The Player's Handbook (or, in Advanced Dungeons &amp; Dragons 1st edition, the Players Handbook) is a book of s for the fantasy role-playing game Dungeons &amp; Dragons. It does not contain the complete set of rules, but only those concerning players of the game. Additional rules, concerning Dungeon Masters, who referee the game, can be found in the Dungeon Master's Guide. Book of Vile Darkness is an optional supplemental sourcebook for the 3rd edition Dungeons &amp; Dragons role-playing game. The book was written by Monte Cook and published by Wizards of the Coast in October 2002. Described as a "detailed look at the nature of evil," it was the first Dungeons &amp; Dragons book labelled for mature audiences. The second was the "good" companion volume Book of Exalted Deeds. Song and Silence: A Guidebook to Rogues and Bards is an optional rulebook for Dungeons &amp; Dragons 3rd Edition, written by published in 2001 by Wizards of the Coast and notable for its trade paperback format. It has not been updated to 3.5 Edition. The guidebook provides supplemental information for characters belonging to the Rogue and Bard base classes. Oriental Adventures (abbreviated OA) is the title shared by two hardback rulebooks published for different versions of the Dungeons &amp; Dragons (D&amp;D) fantasy roleplaying game. Each version of Oriental Adventures provides rules for adapting its respective version of D&amp;D for use in campaign settings based on the Far East, rather than the medieval Europe-setting assumed by most D&amp;D books. Both versions of Oriental Adventures include example campaign settings. The Dungeon Master's Guide ("DMG" or "DM's Guide"; in earlier editions, the Dungeon Masters Guide or Dungeon Master Guide) is a book of s for the fantasy role-playing game Dungeons &amp; Dragons. The Dungeon Master's Guide contains rules concerning the arbitration and administration of a game, and is intended for use primarily or only by the game's Dungeon Master. Unearthed Arcana (abbreviated UA) is the title shared by two hardback books published for different editions of the Dungeons &amp; Dragons fantasy role-playing game. Both were designed as supplements to the core rulebooks, containing material that expanded upon other rules. Neither version of Unearthed Arcana should be confused with Monte Cook's Arcana Unearthed.